Alright, we all know the importance of maintain the right tire pressure. It is in fact the single best thing you can do for your tires. It’s so important that even the National Highway Traffic Safety Administration (NHTSA) now requires all manufactures to install Tire Pressure Monitoring system(s) (TPMS) in all light vehicles. This alerts drivers when a tire becomes under-inflated and in some cases, over inflation. What is Nitrogen you ask? Nitrogen is a DRY light gas that doesn’t burn. In fact, the air we breathe is made up of 78% nitrogen. This molecule is a much safer alternative for your tires. You might not know that most commercial vehicles, military aircrafts, Formula 1, NASCAR, and Indy cars use it as well. Because nitrogen is non-flammable and does support combustion. It reduces the risk of excessive heat build-up in your tires. Fact, nitrogen inflated tires run consistently 20% cooler then air filled. 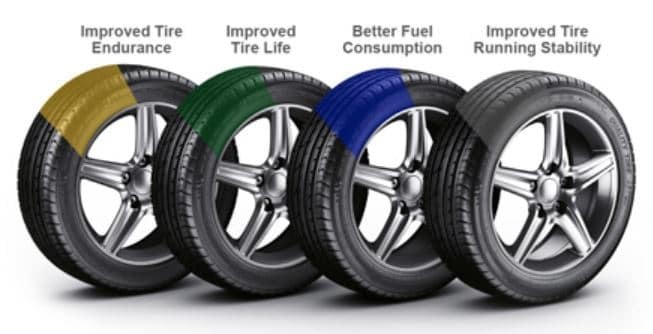 It’s obvious that properly filled tires improve gas mileage. Combine that with the fact nitrogen inflated tires run cooler now you get and EPA improvement of two to three miles per gallon (4% on average). Ay 4% increase EPA, a vehicle with an average EPA of 20 mpg would save approximately 2.5 gallons per week. Based on 40 miles per @ 3.89 per gallon = a saving of over $500 per year! Alright, let’s break this down. Compressed are is about 21% oxygen. The reason why oxygen eats up tires is because it reacts chemically with rubber as it passes through it, causing the rubber to lose its elasticity and strength. Picture an old rubber band. You know how they get all brittle? Similarly oxygen consumes the tire liner and ravages the insulating rubber as it permeates through the entire casing. This dames is increased by the pressure difference between the tire and the atmosphere. Compressed air also contains moisture. Moisture corrodes. Therefore decreasing tire and wheel life. Water vapor and oxygen destroys tires by forming rust in steel body piles, valve stems, and wheels. Oxygen and moisture also create aluminum hydroxide, which corrodes aluminum wheels and rims. The result is premature again, such as tread separation, cracking and blowout. The second most expensive operation expense after fuel it tire repairs OR replacement. Inflating your tires with nitrogen can give you up to 25% more mileage. Not to mention the peace of mind that your family is riding on safe, cool, nitrogen filled tires.